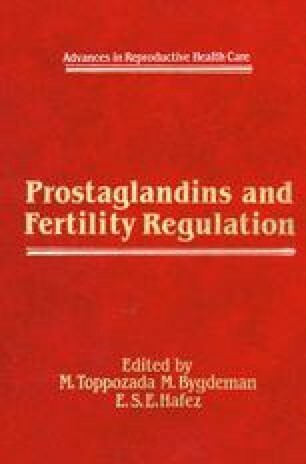 Enzymes controlling the inactivation of natural Prostaglandins (PGs) are lacking in amniotic fluid. The half-life time of PGE2 and PGF2α is therefore considerably longer in the amniotic cavity than in any other body compartment. For PGF2α, it would amount to 6–20 h. Amniotic fluid acts as a storage site from which the injected PG is gradually released and it stimulates the myometrium. The means by which this transfer is operated have not been investigated. The amniotic fluid concentration of the oxytocic decreases progressively due — at least intially — to fetal swallowing and inactivation by fetus and placenta. Additional doses of the abortifacient may therefore have to be instilled. Multiple-dose schedules have given higher success rates than single-dose regimens of natural PGs (Karim and Amy, 1975; Karim, 1979).